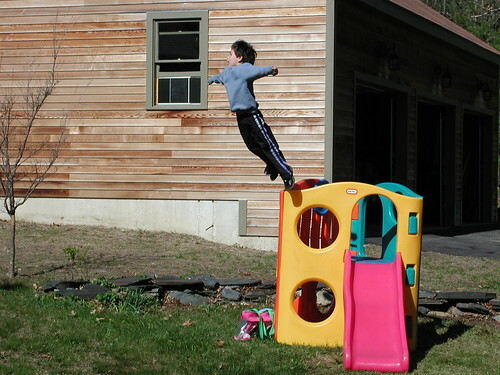 Here's Adam's cousin Michael jumping off our slide three years ago. And recently after completing a soccer head shot. Caught in action! All boy. Oh, my goodness, these shots are stellar! I especially love the second. What a capture! That kid must be on some serious sugar! LOL! Beautiful shots! Talk about great action shots! what beautiful captures!! He looks like a very active boy. 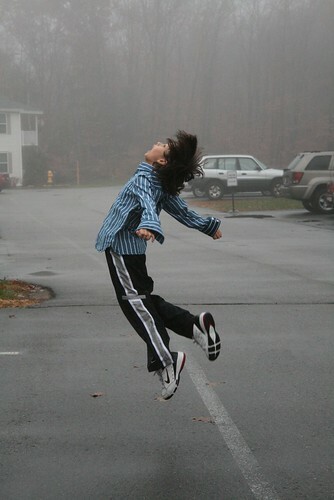 I hope they always believe that they can fly. Wow! He's a dare-devil! The shots are well taken. The timing is perfect! ohhh love the shot! I haven't stop by here for quite awhile..
Wow, I'm glad I didn't see the first one first hand! But it is the perfect practice for the soccer action.